Without a doubt, this is the best and safest way to get to know Morocco. You will be hosted by a private guide all along the journey. You will arrive in the city of Fez, where you will spend two nights at the Sofitel Palais Jamais Hotel. You will be able to walk round the city and suburbs. It has proved to be one of the imperial cities with greatest tourist interest because of its history, crafts and one of largest Medinas in the world, the madrasas, the zoco (amazing for its quantity and variety of spices), Karauin, the oldest university of the world, the mosques, the square, the Andalusian and Potters neighbourhoods, palaces and museums. The craft of Fez is famous worldwide. On the third day, you will set out for the Middle Atlas Mountains. You will stop over in the lovely city of Ifrane, also called the "Swiss of Morocco", the remains of the times of the French Protectorate. You will travel through great cedar forests which are home to communities of nomadic shepperds. To the south, leaving the High Atlas Mountains behind, you will arrive in Errachidia, where the first palm-tree forests start appearing. This oasis creates a perfect microclimate for growing all kinds of fruits and vegetables. Going on our journey, you will reach Erfoud, the economic centre of the Tafilalet region. The fossils found in this area prove that the sea used to cover it in the past. The pavement disappears at this point, and you will get to the adobe town of Merzouga. Before dinner, you will go on a camel ride to watch the sunset. Dinner and accommodation. Dar el Janoub Hotel. On the fourth day, you will have breakfast and go on a full-day excursion to the town of Risana, ancient Sijilmassa, centre of supply of the ancient caravans coming from the Sahara. Later, you will stop in Goulmima to visit Ksur (an adobe fortified village) of the 15th century, still inhabited by over 2,500 people. You will continue the journey through a semidesert landscape, to reach the oasis of Tinghir, which is probably one of the most beautiful places in Morocco. Going up the river Todra, you will get to the amazing gorges which are over 300 m high. Dinner and accommodation. Kasbah Lamrani Hotel. On the fifth day, after a short visit round the town, you will depart for Dades River gorges via the Thousand Kasbahs. The river has eroded the rocks to form a peculiar landscape in the rocks. This area has a special microclimate allowing the growth of vegetation and crops in the middle of vast palm-tree forests. Arrival in Ouarzazate, one of the most important cities in the South of Morocco and wordly known because several historical movies were shot there, such as Gladiator, Troy, The Mummy, etc. Excursion to the Taurit Kasbah. Dinner and accommodation. Riad Dar Kamar Hotel. On the sixth day, after breakfast you will head for Ait Ben Haddou, the queen of the Kasbahs, declared cultural heritage of humanity. You will arrive at the Kasbah of Telouet, ancient palace of Glagui, Pacha Marrakech, by one of the most beautiful tracks in Morocco. Along a meandering road, you will go through the highest mountain harbour in Morocco, Tzin Tichca (2,260 m) to arrive in the imperial city of Marrakech, capital of the Great South. Dinner and accommodation. Sofitel Hotel. Walking through "Djemma El Fna" square has proved to be a unique experience, the centre where all the life and activity of the city get together: dancers, story-tellers, jugglers, craftsmen, salesmen and snake charmers. Dinner and accommodation. You will spend two nights in this exciting city. Reception at the airport in Fez and transportation to the 5-star Palais Jamais Hotel, including breakfast and dinner. Afternoon at leisure. Breakfast. Full-day city tour round Fez, religious and cultural capital city of Morocco. You will visit the mosques, the squares, the neighbourhoods of the potters and the Andalusians, and the Medina. Breakfast and setting out for the Middle Atlas Mountains. You will stop over in the lovely city of Ifrane, also called the Swiss of Morocco, the remains of the times of the French Protectorate. You will travel through great cedar forests which are home to communities of nomadic shepperds. To the south, leaving the High Atlas Mountains behind, you will arrive in Errachidia, where the first palm-tree forests start appearing. This oasis creates a perfect microclimate for growing all kinds of fruits and vegetables. 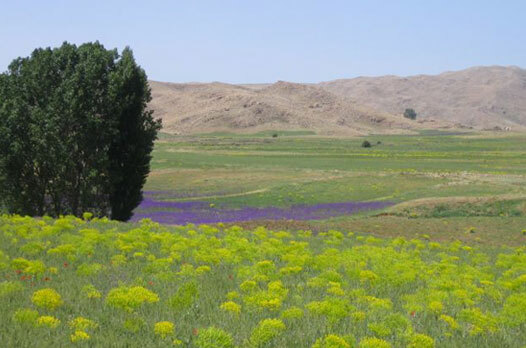 Going on our journey, you will reach Erfoud, the economic centre of the Tafilalet region. The fossils found in this area prove that the sea used to cover it in the past. 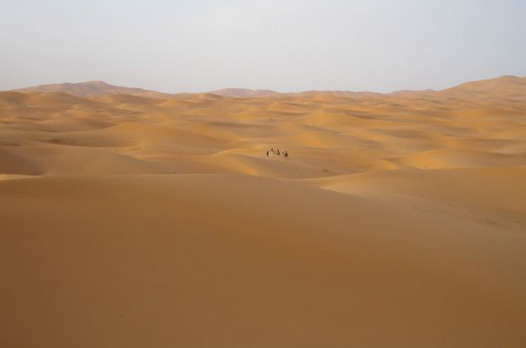 The pavement disappears at this point, and you will get to the adobe town of Merzouga. Before dinner, you will go on a camel ride to watch the sunset. Dinner and accommodation. Dar el Janoub Hotel. Breakfast and full-day excursion to the town of Risana, ancient Sijilmassa, centre of supply of the ancient caravans coming from the Sahara. Later, you will stop in Goulmima to visit Ksur (an adobe fortified village) of the 15th century, still inhabited by over 2,500 people. You will continue the journey through a semidesert landscape, to reach the oasis of Tinghir, which is probably one of the most beautiful places in Morocco. Going up the river Todra, you will get to the amazing gorges which are over 300 m high. Dinner and accommodation. Kasbah Lamrani Hotel. Breakfast and after a short visit round the town, departure for Dades River gorges via the Thousand Kasbahs. The river has eroded the rocks to form a peculiar landscape in the rocks. This area has a special microclimate allowing the growth of vegetation and crops in the middle of vast palm-tree forests. Arrival in Ouarzazate, one of the most important cities in the South of Morocco and wordly known because several historical movies were shot there, such as Gladiator, Troy, The Mummy, etc. Excursion to the Taurit Kasbah. Dinner and accommodation. Riad Dar Kamar Hotel. Breakfast. Full day guided tour round Marrakech. It is said that the city was inhabited by a tribe coming from the other side of the Atlas, who had brought large amounts of dates with them. From their bones, a huge palm-tree forest was born. 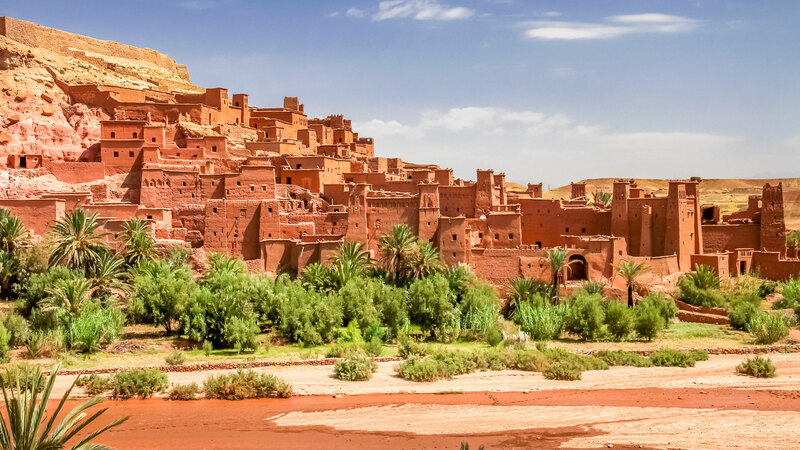 Also called the red city for the colour of its walls and gardens watered by underground wells (khettaras), built by the Almoravides and nomadic tribes from the Sahara in the 11th century. In the 12th century, Marrakech reached splendour with its unique architecture and culture. Day at leisure until the scheduled time to leave for the airport to take the flight back to the city of origin. Arrival. End of our services.